I think any time someone is presented with a challenge, the first question that pops into their head is: Is it worth it? Is the extra effort at work worth missing out on family time? Is eating that second bowl of ice cream worth the pain it will cause in my belly? Is sacrificing some sleep to finish a really good novel worth it? Is pulling over to help someone change a flat tire worth being late to wherever you are going? Is buying a new car worth the extra cost compared to buying used? You get the idea – oh and to answer my questions so they aren’t rhetorical. No. Yes. Yes. Maybe. I have no idea. I was recently faced with this question while hiking with my friend Thomas Kyle-Milward. 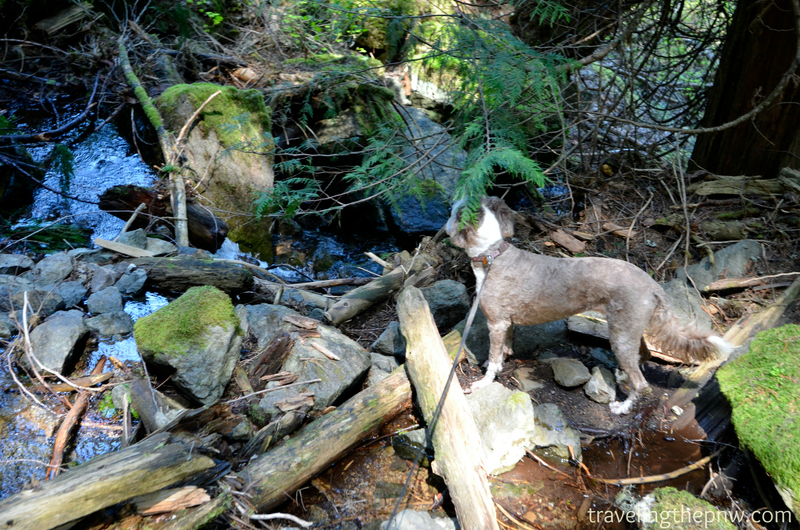 We had just finished conquering Suntop Mountain and had moved onto a hike to see Skookum Falls. 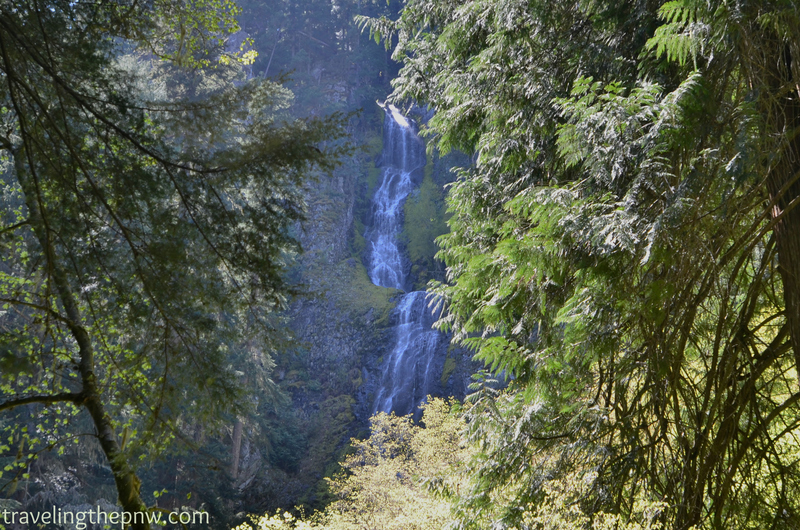 Skookum Falls is at least 200 feet tall, and has multiple cascades. This was shot from further down the trail. There is also apparently a viewpoint from the highway that affords similar views. After wandering around in the woods for a few miles, we came to the base of a very steep hill and a sign that simply said: “Falls” with an arrow pointing up. As we stood there, we decided at least initially, climbing this hill was worth it. So, up we went. I wouldn’t really call it a path, more a scramble up loose dirt, downed trees, rocks and a creek. I had to stop frequently because my legs were shot from climbing the aforementioned mountain (1,100 feet of elevation gain in one mile). A flat spot about halfway up the hillside to the base of Skookum Falls. Molly enjoyed cooling off in the creek. My friend Thomas Kyle-Milward scaling the debris pile to reach the vantage point where we got our good photos of Skookum Falls from. 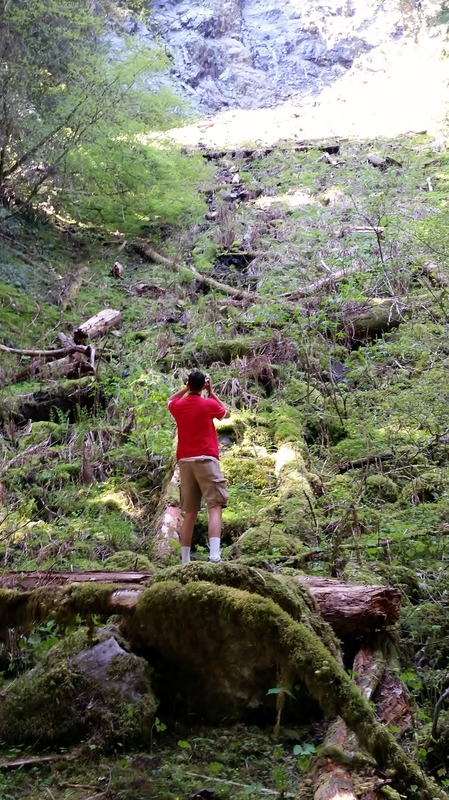 We eventually climbed to the middle of the moss-covered tree to his upper left. He didn’t respond, but made his way back down to my position. At that point, I was done hiking. I still hadn’t caught my breath and we had a two-mile hike back to the car, then a 90-minute drive home and then straight to work to put out the newspaper. 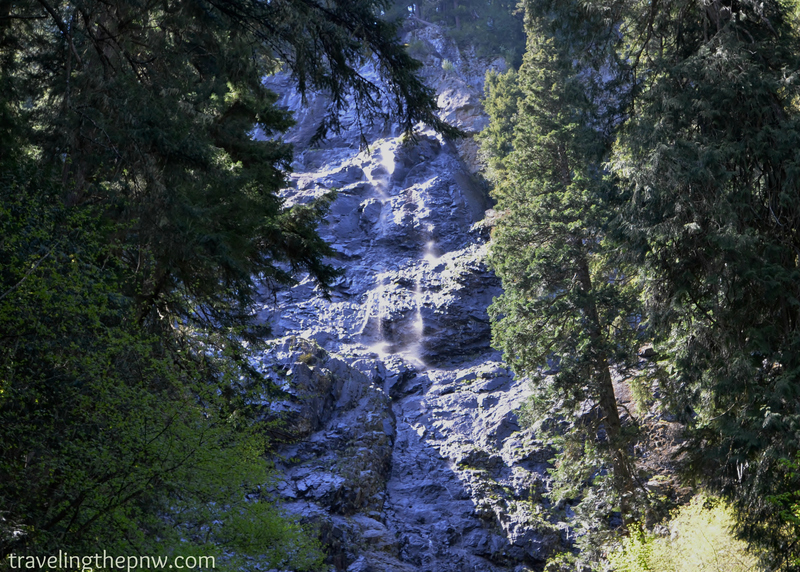 But then again, I certainly hadn’t hiked all this way to take a crappy photo of a waterfall shrouded by trees. So, again, I asked Thomas if it was worth it. He showed me his phone and I made my decision. I quickly scurried over the creek, shimmied up the moss covered tree, half fell half climbed up a hillside coated in moss, and eventually reached an area with good footing and parted the tree branches in front of me and grabbed a few photos of Skookum Falls. So, dear reader, you tell me. Was it worth it? Climbing the side of a mountain was a bit intense to reach this point, but I think this photo was worth it. Skookum Falls is gorgeous. If you go Location: Heading south on Highway 410 out of Enumclaw, go 25 miles past the tiny hamlet of Greenwater and turn right on Forest Road 73. Take the gravel road across the river and park in the lot immediately to your right. When: I’ve read online that this can be hiked year round, but I think late spring would be best because water flow would seemingly be higher. What: Skookum Falls, a 366-foot waterfall near the northeast corner of Mount Rainier National Park in the White River valley upstream from Enumclaw. Fees: Northwest Forest Pass required. $30 per year or $5 per day. Honored at all Forest Service operated sites in Oregon and Washington. 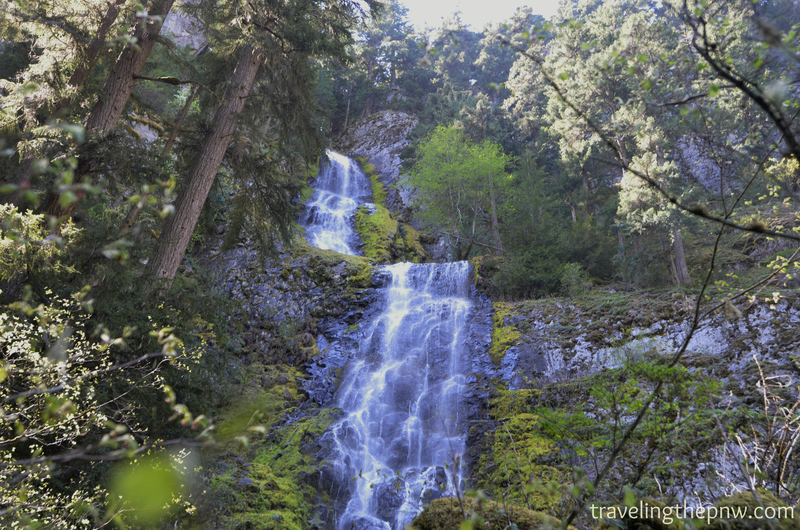 Kid-friendly: I’m not sure at what age I’d be willing to let my child scamper up the hillside to get close to the falls, but it is an amazing hike even to that point. 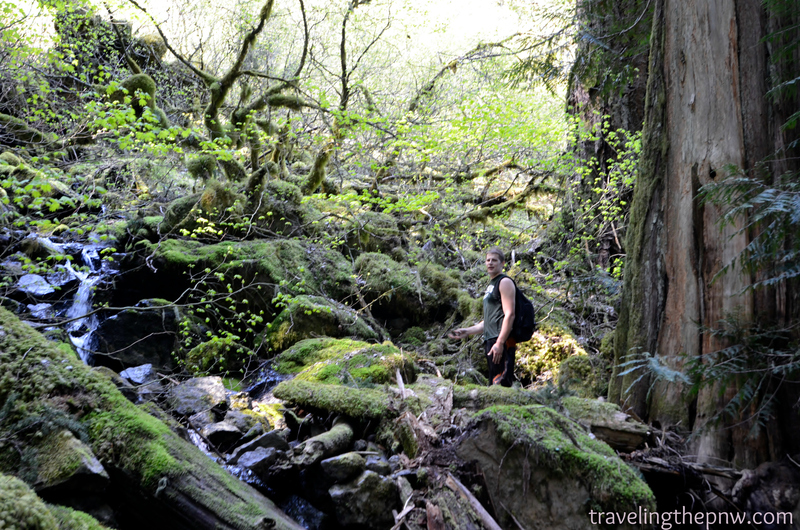 Stunning old growth forest, fantastic river views and plenty of long-distance waterfall views. 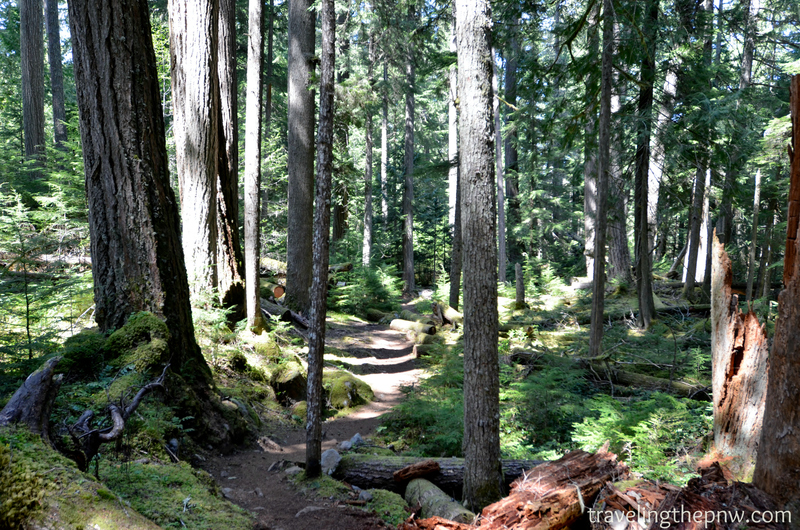 The Skookum Flats trail is well defined and winds its way through amazing old growth forest, as well as spots next to the White River. It features very little elevation gain, and is a good family hike. Initially we thought this was Skookum Falls and were a bit disappointed. This was beautiful in its own right, though. A very gentle stream, misting down the side of a giant rockface. It has no name, as far as I can find. These two trees are actually one at the base. 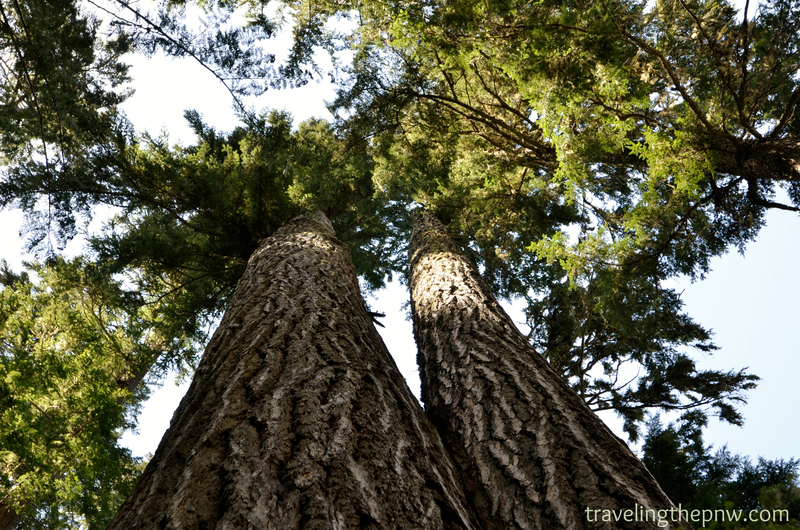 Huge old trees at the beginning of the Skookum Flats trail. 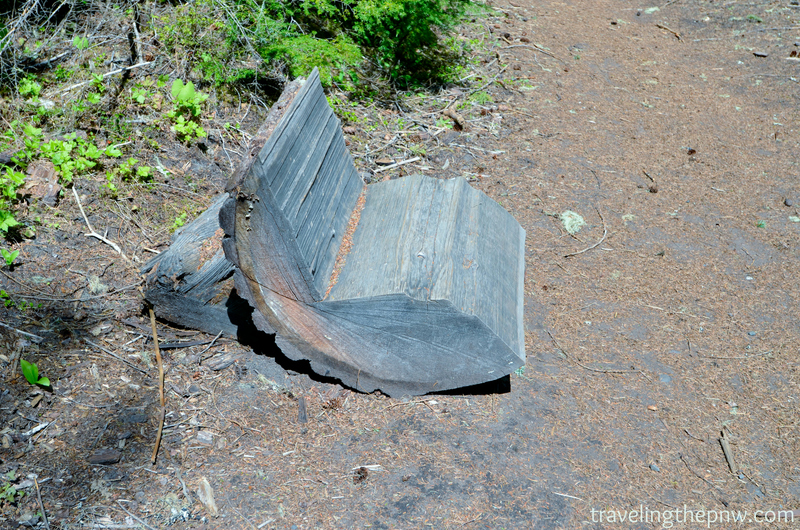 Hilarious bench that someone cut out of a fallen down tree. Need a rest? Why not sit here. I’ve read about skunk cabbage, but never seen it in the wild. There was lots of it growing in the forest on this hike. 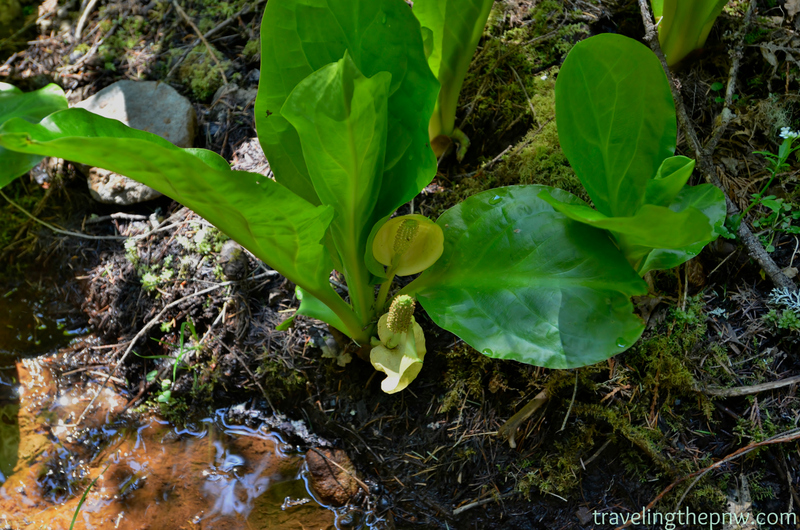 I also know why they call it skunk cabbage now. Thanks for this post. I’ve been wanting to do this hike. I hope you get to do it soon!